Andrea Lyon, the attorney for accused child murderer Casey Anthony, was invited on Thursday's Today show to discuss the case and promote her new book and was given a platform to call the death penalty "A barbaric institution," and to spout that the U.S. is in the "company of Iraq and Iran and China." MEREDITH VIEIRA: In about the 30 seconds that I do have left, even if Casey Anthony were to be found guilty when this case goes to trial, which should be in June, you do not believe anybody should be given the death penalty, that it's never appropriate. Why? ANDREA LYON: I believe that the death penalty is a barbaric institution. We're the only civilized country - we're in the company of Iraq and Iran and China, and I'm against the death penalty. MEREDITH VIEIRA: Now to the woman leading the defense of Florida mother Casey Anthony. Anthony is behind bars awaiting trial for the 2008 murder of her two-year-old daughter, Caylee. We're gonna talk to her lawyer, Andrea Lyon, in a moment. But first, here's NBC's Kerry Sanders. KERRY SANDERS: Twenty-three-year-old Casey Anthony, accused of murdering her two-year-old daughter Caylee and in Chicago, her attorney, Andrea Lyon, is confident her client will walk. The once tie-dyed idealist from the '60s has one agenda: preventing any one from ever being executed. ANDREA LYON: It's killing. That's what you're doing. SANDERS: Casey Anthony is accused of callously killing her daughter and then partying around Orlando for 31 days before finally telling her mother Caylee was missing. SANDERS TO LYON: There are folks who say how could you not want that person to pay with their own life for the horrible crime that they committed? LYON: Well, that's because we have this two-dimensional good guys versus bad guys way of telling stories in this country. SANDERS: Lyon has an unmatched record of success when it comes to the death penalty. She's never lost. It's earned her the name the Angel of Death Row, but that angelic title is in sharp contrast to her controversial comments recorded and posted online where she derides female prosecutors. LYON: They all wear those little ties and have [bleep] at home, whatever. SANDERS: Andrea Lyon is not just the lead attorney on this case, she's also Professor Andrea Lyon here at DePaul University in Chicago, where she has upwards ofa dozen students as part of their course work also working on this case. But with Casey Anthony, the question is, has the Angel of Death Row this time chosen an unwinnable case? For Today, Kerry Sanders, NBC News, Chicago. VIEIRA: Andrea Lyon is with us now. 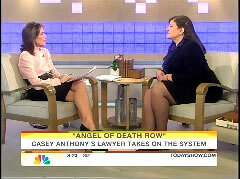 She has written a new book Angel of Death Row: My Life As a Death Penalty Defense Lawyer. Andrea, good morning to you. ANDREA LYON: Good morning, Meredith. VIEIRA: When Kerry just started his piece, he said at the top of it that you were confident that Casey Anthony would walk, and you said, under your breath, "I'm not." LYON: Of course I'm not. I mean there's always a presumption of guilt, and the intense media scrutiny here has made it, as far as I can see, virtually impossible to get a fair trial and to, we're rolling an even bigger stone up a bigger hill than you normally are. VIEIRA: No you said you're scared to death. LYON: I'm scared, yes. I'm scared for my client. I'm afraid that the fact that she's been pilloried in the press. I would liken this, Meredith, to the Salem witch trials, actually. And for those of your audience who don't know what I'm talking about, there was a sort of mass hysteria in Massachusetts where people thought people were witches, and mostly women. And if a woman behaved differently, she didn't act the way she was supposed to act, she would get accused of being a witch. And the test was throwing her in the water. Now if she floated, if she could swim, she was a witch, she was guilty and she was killed, burned at the stake. If she drowned, she was innocent. VIEIRA: Either way, she's dead is your point. LYON: Either way, she's dead. VIEIRA: -and the judge denied that. VIEIRA: What kind of a setback is that for your client? LYON: Well, it's a setback. We're disappointed in the ruling. We believe that as a legal matter and as a factual matter we were correct, but we will proceed on. There are other motions to file, other challenges to do and we're going to do them. VIEIRA: But does that put a lot of pressure on Casey Anthony to, to plea bargain here? LYON: Well, that is one of the effects of the death penalty. It does put a lot of pressure on a defendant to plea bargain, even when they didn't, they didn't do it. They didn't kill their, she didn't kill her kid. VIEIRA: You're, you're absolutely sure without a doubt? LYON: Based on things I can't tell you because they're confidential, but based on the evidence as well. I mean, there's not even any evidence that this was a homicide let alone any evidence tying her to it. VIEIRA: So, are you also convinced, then, that there is no way that she can get a fair trial at this point? VIEIRA: Change the venue, right? LYON: And we hope to move to a larger venue where the saturation isn't as much and we have a broader and more diverse jury pool. We certainly hope so. VIEIRA: I want to talk about your book Angel of Death Row. It chronicles your experiences as the first woman to serve as the lead attorney on a death penalty case. You've done many since then, and you've won every single one, actually. VIEIRA: So far. And you say that one of the advantages, that you have as a woman is that you're able to tap into the emotions not just of your clients, but the juries as well. How big a role does emotion play in a high-profile case like, like Casey Anthony's? LYON: Well, you ignore emotions at your peril. I mean people feel fear of crime. They, they are disgusted or horrified at things that happen. And if you pretend that those emotions don't exist and just say, you know, "Just the facts, ma'am," that, that doesn't work. I don't mean that, that it's sort of, you know, we all hold hands and it's touchy-feely. I don't mean that. I mean, you have to pay attention to what people are feeling, what they're thinking. You have to be respectful of them and you, you have to understand the anger that people feel when someone's life is cut short. VIEIRA: And there's a lot of anger directed at your client right now. LYON: At our client and at us personally as well. VIEIRA: Very, we have very little time left. In about the 30 seconds that I do have left, even if Casey Anthony were to be found guilty when this case goes to trial, which should be in June, you do not believe anybody should be given the death penalty, that it's never appropriate. Why? LYON: I believe that the death penalty is a barbaric institution. We're the only civilized country- we're in the company of Iraq and Iran and China, and I'm against the death penalty. VIEIRA: Alright thank you so much, Andrea Lyon, for your time.